Lucas Torreira’s strike ensured Arsenal recovered from the disappointment of Alexandre Lacazette harshly having a goal ruled out to win 1-0 against Huddersfield and extend their unbeaten run to a 21st match. The French striker had been unfortunate not to have given Unai Emery’s team a first-half lead and their increasing frustration showed as two players were booked for diving. Yet there is again an optimism surrounding their prospects, owing largely to the improvement they have demonstrated in not losing since visiting Chelsea on August 18, and that self-belief and resilience gradually led to the goal they deserved with Lucas Torreira’s fine finish seven minutes from time. The hosts had made another of their slow starts until two fine chances in the space of two first-half minutes could suddenly have given them a convincing lead. First Matteo Guendouzi and Granit Xhaka combined for the latter to cross towards Pierre-Emerick Aubameyang, who was unfortunate when he attempted a first-time, left-footed finish at the near right post that deceived the diving Jonas Lossl but ended up narrowly wide. In a further show of the one-touch football Emery has rediscovered, as Aubameyang, Hector Bellerin and Guendouzi then split the visitors’ defence, Guendouzi found Lacazette in time and space but watched as the striker struggled to control and connect, instead shooting over the crossbar. If Lacazette was already frustrated – on Wednesday at Manchester United an own goal was awarded to Marcos Rojo when he felt he had scored – he was harshly denied again shortly before half-time when he found the back of the net. From Bernd Leno’s goal-kick Aubameyang headed towards Lacazette but if he was in an offside position, Mathias Jorgensen then effectively played him on when, after he had moved, the defender collected possession and played a poor back-pass into his path. Instinctively Lacazette raced for the ball, rounded Lossl and calmly finished, yet referee Paul Tierney disallowed to give Huddersfield the good fortune they had not earned. By the half-time whistle former Tottenham midfielder Alex Pritchard had threatened for Huddersfield and Torreira had forced a fine save from Lossl when he curled towards the top corner, before Shkodran Mustafi being rightly booked for diving in the area concluded the opening 45 minutes. When Henrikh Mkhitaryan, on for Lacazette, shot narrowly wide with the first chance of the second half, Arsenal’s opening goal again appeared imminent but it instead took until the 83rd minute for them to go ahead. Their increasing desperation was captured when Guendouzi was also booked for diving, this time having exaggerated a challenge inside the penalty area from Aaron Mooy. 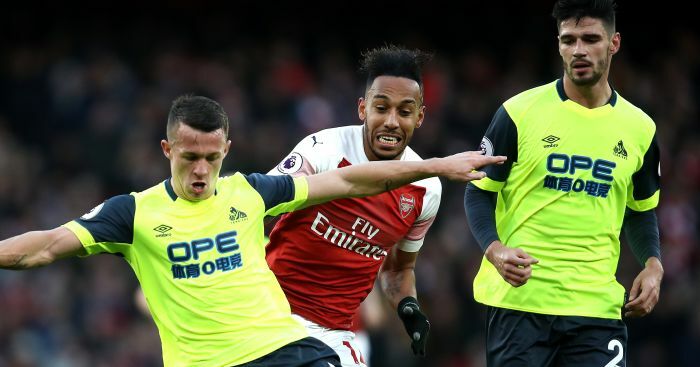 Crossing towards Aubameyang, he watched as the striker chipped to Torreira after struggling to get a shot away, teeing Torreira up to acrobatically volley into the bottom left corner of the near-open goal, maintaining their pursuit of the top four and leaving Huddersfield in the bottom three.